Has that week-old yogurt really gone bad? Did the chicken you bought just three days ago already spoil? Your smartphone might one day be able to tell you, new research suggests. A group of scientists is developing a portable, inexpensive and easy-to-use electronic tag to send wireless alerts to smartphones when a telltale gas is emitted by rotten food. "As we know, spoiled food can be very harmful to our health," said study author Guihua Yu. "But sometimes we cannot easily notice the slightly degraded food by smell or vision. Therefore, we aim to develop a cost-effective wireless sensor for food spoilage detection with the assistance of mobile phones," he explained. Yu is a professor of materials science and mechanical engineering at the University of Texas at Austin. Foodborne illnesses strike 48 million Americans each year, leading to over 128,000 hospitalizations and 3,000 deaths, according to the U.S. Centers for Disease Control and Prevention. To tackle the problem, Yu and his colleagues first put together a tiny gas sensor with a very high sensitivity to the odor-causing "biogenic amines" that are released when food goes bad. Then, the team embedded the sensors into "near-field communication" (NFC) tags, of the sort already deployed by businesses to track product shipping. The NFC sensor tags were then put through a bad meat test, because slightly spoiled meat is a good example of something that can prove very harmful but also difficult to detect. After placing tags next to a bunch of meat, the researchers left the meat out in a temperature of 86 degrees Fahrenheit, guessing that a notable amount of telltale biogenic amines would be produced by the end of the test period. 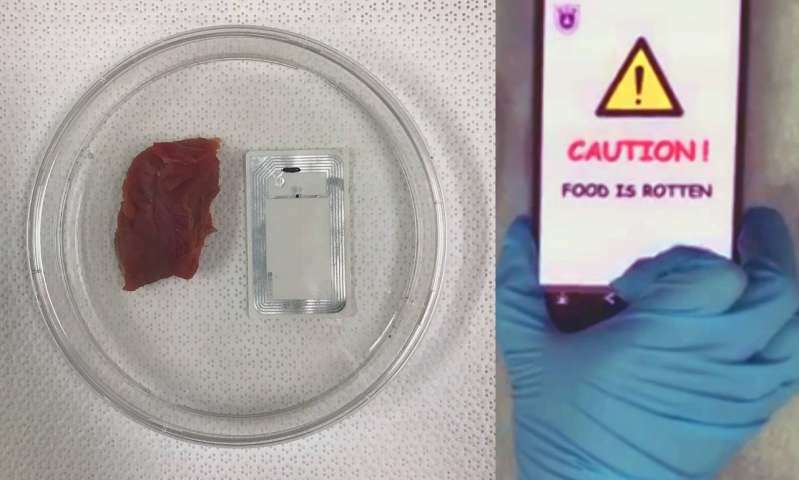 Sure enough, the sensor tags detected the biogenic amines, and communicated the presence of bad meat to a smartphone located within reach of the NFC's wireless range (usually less than 4 inches). The findings were published June 27 in the journal Nano Letters. Yu noted that the investigation was preliminary and that "it will still take some more time before it is ready for market" so that he and his team can try to improve the phone interface and device-packaging design. "We developed the sensor possibly for both individual consumer households and industrial purposes," said Yu. "On the one hand, the sensor has shown clearly it has potential in daily life because it is very convenient and precise for consumers, only requiring a mobile phone embedded with an NFC module. On the other hand, this cost-effective method avoids complex equipment and trained personnel, which will appeal to the detection needs in large quantities for some food facilities," he explained. But the concept doesn't appeal to food-safety expert Lona Sandon. She's program director in the department of clinical nutrition with the University of Texas Southwestern Medical Center's School of Health Professions, in Dallas. "My concern with a sensor such as this is just how sensitive is it. If it detects gases at very low levels, will we end up throwing food out when it is still edible, further increasing the problem of food waste?" she said. "I am also not sure we need a smartphone to tell us whether the food is past its prime or not. Smell, sight and common sense usually are pretty good for indicators," Sandon added. "A quick visual inspection of fruits, vegetables, cheeses and meats can tell you a lot about whether or not the food is still good to eat. Discoloration, soft spots, bruising, or fuzzy stuff growing on the food are easy to spot. Off-putting smells from things like milk and meat are also pretty easy to detect without a fancy gadget," she suggested.